If you are resorting to using an excel spreadsheet for creating a cap table for your company, then you may be in for a bundle of complications and issues later on. As your company grows and your cap table becomes more complex, the chance of you missing some key detail increases, which may affect if your following regulations and tax filings for your company shares. The best way to stay ahead of these issues and track your company’s equity properly is by using an advanced software created specifically for your company’s needs and to help your company stay compliant with equity laws. One such software is Eqvista. It is a FREE web application to manage your company shares and keep everything organized in a cap table. For you to understand the idea of using a cap table and why Eqvista is the right application that can assist you best, go through the points below. A cap table, known as a capitalization table, is a list of securities that a company owns and issued to its shareholders. The securities can include shares of the company, warrants, equity grants and convertible notes. 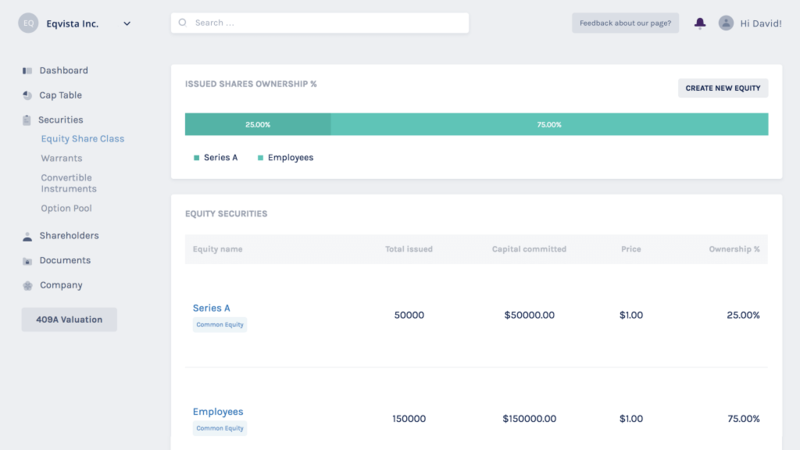 Every founder should have a cap table that tracks of all the shares that the company owns. In the cap table, the founders are listed on the top along with the shares that they own. After the founders, there are the executives and the key employees who hold equity. Then comes the investors who have funded the company in exchange for equity, such as venture capital firms and angel investors, or any other people who are involved in the business plan. In short, the cap table holds the details of the ownership stakes on a fully diluted basis. With a proper cap table, the founder would have the overall capital structure of the company right in front of them. Moreover, if anyone needs to understand more about the financial structure of the company, it can be seen with a glance of the cap table. At the beginning of a company, the cap table would be simple and contain all the details of who owns options, warrants, stocks or any other investments made for the company. But as the company grows, the cap table becomes more complex. In a complex cap table, you would be able to see things like public offerings, mergers and acquisitions, potential new funding sources, or any other transactions along with the basic information of who owns how much and what kind of equity. Basically, every line in the cap table should be able to add value to the business and make the business attractive to investors, partners and the key employees. How to create a cap table? For a long time, founders have used Excel spreadsheets for creating their cap table, as it was the most common and easy way to keep track of this information. Even though using an excel spreadsheet to create a cap table is not a bad idea, it is also not the best one. Initially, it would be easy to fill in the table and keep a record of all the data. But as the company grows and you add in more investors and employees to the list, things quickly become complicated. With this amount of information captured in the cap table, you would be spending hours understanding your financial structure and making decisions for you company. Other than that, when an investor asks to see your company’s cap table, they would find it difficult to understand things. This could make you lose a potential investor and the investment you were hoping to get. Basically, having a cap table that is a disorganized or overly complicated would make things tough for you as a founder. And to be clear, cap tables become complicated very fast as soon as your company initiates business. We are glad you asked! With things advancing in the technical front of the business industry, many companies have developed cap table software programs to ease the difficulty of recording, tracking and maintaining a cap table. This means that you can now use the cap table software program, and save both time and money. And from the many available to download, Eqvista is a FREE cap table software, making it the best option for you. 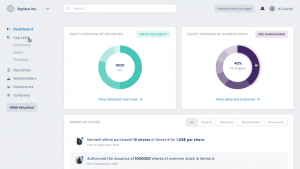 Eqvista started with the idea to make it easy for entrepreneurs to record and keep track of their company’s shares. The technology used to create the Eqvista cap table software program would make the system easy for you to manage your shares, keep a neat cap table, comply with all legal laws, and file the necessary company reports or files with the government when needed. The main objective of Eqvista is to help all the entrepreneurs right from the time the company begins. This means that, from filing your company with the states Division of Corporations to the assisting in issuing shares for your company and recording it in a well-managed cap table, Eqvista would be there to help you. But that is not all. The experienced team would also help you with tedious legal filings related to the equity of your company, and ensure that you comply with the equity related laws. In short, Eqvista has been developed in such a way that would influence the way in which each section of the company filing works. With an aim to simplify things, the things that took days to be completed, can now be done in minutes with Eqvista. Starting a company and managing the cap table can become complicated if not handled well. With all the legal complexity, lengthy paperwork, long hours, numerous fees, and difficult company decisions, you can end up giving everything that you worked so hard on to build your empire either directly (by selling your company at a low rate) or indirectly (by making bad decisions that dilutes your ownership of the company). To avoid such issues and make the process of being a founder easy, Eqvista was created. It is a well-advanced tool that handles everything that you as a founder needs, and all in one place. There are a lot of benefits that Eqvista has to offer, explained more in the next section. Company Incorporation: As soon as you have your idea ready and your business plan in place, contact Eqvista to have your company incorporated in no time. With a large team and a history in successfully incorporating many businesses, Eqvista would help you in making the process simple and fast. All you need to do is offer the team with the needed documents and sign where needed to have your company set up easily. Issuance of Company Shares: Eliminate all the paperwork while issuing share certificates for the shareholders. With Eqvista, you would be able to issue shares electronically, creating electronic certificates as well. In short, you would not have to spend a lot of time and effort to issue shares to an investor or new founder with Eqvista. Cap Table Management: This is the best part of the Eqvista app. With the main aim of turning the difficulties that founders face in managing their cap table into a seamless task, Eqvista was created. In short, you would not only be able to manage the company’s equity, but you would also be able to stay up to date with any company filings needed. 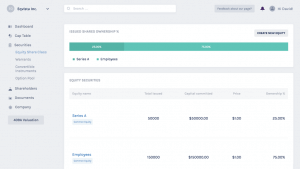 Share Management: Eqvista helps you to manage all the shares of your company online in the simplest way possible and for FREE. You would be able to issue shares to new members, transfer any existing shares, and many other things, all online and through the Eqvista freeware. All you need for this is an internet connection and a device that connects to the internet. All this is just a click away. Connect & Share information with Others: Another thing that many founders are worried about is the ease in sharing the cap table details or share details with many people at the same time. 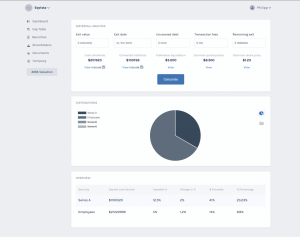 But with the Eqvista software program, you can now share all the data that you want to selectively with your lawyers, accountants, shareholders, founders and so on. In short, you would have the power to grant full or limited access to others easily using this software. 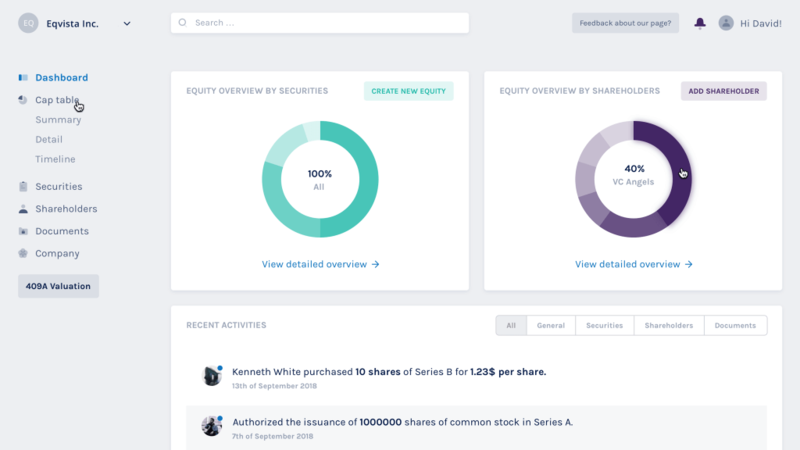 Moreover, you would also be able to download any report and keep an eye on all what your shareholders, founders, or employees are doing with the shares in just one place. Waterfall Analysis: Eqvista offers the most powerful waterfall analysis that is available in the market. This analysis then helps you by forming a visualization data displaying all the funding rounds of your company. Moreover, it would also display your share dilution along with the various exit waterfall scenarios. Model Your Next Funding Rounds: The most precious resource of your company which you own is the shares. Hence, it is important that you choose the right model for the next financing round. Do not keep making mistakes like everyone else. With the help and guidance of Eqvista, you would be able to make the right equity decisions. Stay Complaint: From the ASC 718 stock expensing rule to the ISO limits and rule 701 compliance, Eqvista would help you stay compliant with all the rules of the government that are related to equity and share plans. 409A Valuation & Reports: During the lifespan of your company, you would need to have its valuation done and create the 409A reports that would help your company move ahead. With Eqvista, you would be able to get the best 409A valuation when needed. Financial Analysis & Company Standing: While you use the Eqvista application to store all the important financial reports of your company and handle all the transactions through the platform, you would easily be able to generate the financial analysis of your business. With the complete records, you would know exactly where you company stands. Out of all the benefits mentioned above, the thing that makes the Eqvista platform worth a try is that the platform is free to use. This means that you would not have to pay a penny for using it to make your cap table and manage everything online. There are no hidden fees and no recurring subscriptions for anyone to use the software. Eqvista believes that entrepreneurs should have the chance to enjoy running their company with ease as they keep track of all their shares online. So, being an entrepreneur, you can easily manage the cap table and keep it updated and organized, and spend your extra time to grow your companies and business ideas. In short, if you like the idea of this platform and wish to give it a try, join the community. To become a smart entrepreneur and stay ahead of any trouble (legally or otherwise), join Eqvista to make things easier for you. The best thing about this is that it is FREE, and you can easily create as many company profiles as you want. The app would let you comply with the rules as well. Check it out & register to begin using the Eqvista software program today!